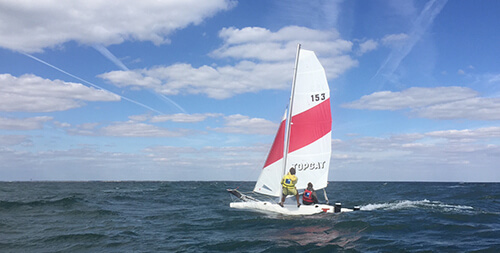 Quick, stable and easy to use, the Topaz 12 is suited to young sailors, ages 9 to 12. She is our smallest catamaran, making it ideal to introduce the youngest to the pleasures of sailing! With a crew capacity of 2 or 3 people, stable, fast and even with a spinnaker you will probably sail on trapeze and maybe faster than the wind ! A good way to have fun with friends while surfing the waves or racing with your instructor. And if you have already improve this boat, think about the next stage : our new Topaz 14. 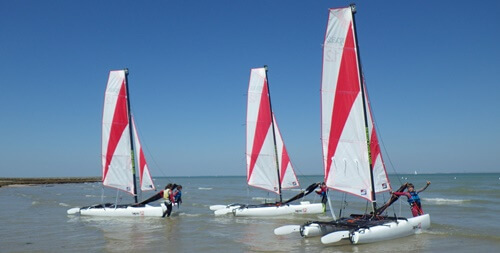 Following the success of the Topaz 12, the club now offers the children aged between 10 and 14, who already sailed, the opportunity to try the Topaz 14. Indeed, this slightly bigger and more efficient catamaran is the obvious next step for the learning process. It is also equipped with trapezes and a spinnaker, enabling to make the best use of the boat. You’ll be able to access a fleet of 5 brand new Topaz 14 starting April 2017! 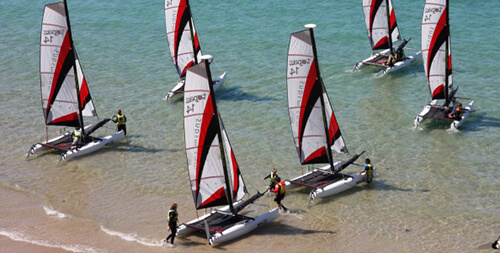 From ages 15 to 77, the Topcat is ideal to discover and practise catamaran sailing, but also to improve your level. This boat is suited to everyone and offers you a thrilling experience, thanks to the variety of sails we have at our disposal to equip it with. Your instructor will teach you the basics of sailing in perfect safety and will make sure you understand all necessary sailing knowledge. You’ll sail in groups of five to six boats with a crew of two people each. If you attend the improvement training course, you’ll be able to practise with the trapeze and spinnaker. Teaching you to be autonomous so you can enjoy sailing by yourself and share your passion with your family and friends.